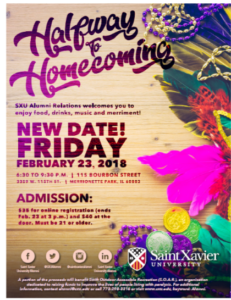 SXU Halfway to Homecoming Event | S.O.A.R. It may not be Fat Tuesday, but let’s get Mardi Gras started! SXU alumni don your feather masks, beads, hats, and costumes, and gather your friends and family to join us on this “Fat Friday” for food, drinks, music and merriment! FRIDAY Ι February 23, 2018 Ι 6:30-9:30 P.M.
A portion of the proceeds will benefit Swift Outdoor Accessible Recreation (S.O.A.R. ), and organization dedicated to raising funds to improve the lives of people living with paralysis. For additional information, contact alumni@sxu.edu or call 773-298-3316 or visit www.sxu.edu, Keyword: Alumni.